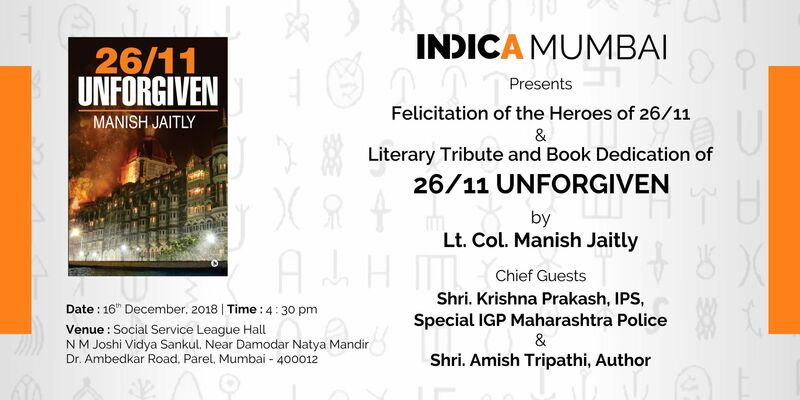 Indic Academy’s Center for Indic Writers (CIW) announces its first author showcase with the release of 26/11 Unforgiven by Lt. Col. Manish Jaitly. The book is a fictional story of an ordinary citizen who takes on the task to extract revenge from terrorist. The backdrop of the story is based on the 26/11 attack on innocent citizens of Mumbai which was a watershed event in the history of independent India. Indic Academy through its various City Chapters announces the launch of the book. The first launch will be held in the city of Mumbai on December 16th 2018. Other city launches will be announced later through its social media coverage. About the Book: Ten terrorists from Pakistan managed to enter the city and opened fire on unsuspecting citizens indiscriminately killing more than 150 people and injuring hundreds of others. Vikrant Maheshwari, the main protagonist of the book, lost his wife and daughter while they were at the Taj Mahal Hotel that night along with him celebrating his wedding anniversary. While recuperating he learns the deep genesis of the Indo-Pak problem and the history behind it. Vikrant awaits the government to give a befitting reply to the terror feeding nation. Sadly, the government decides against any military action and adopts the diplomacy route. The calls for revenge slowly turn into calls for justice. But with passage of time and National and International Geo-Politics at play justice too seemed to be elusive. Vikrant was thankful that Ajmal Kasab had been caught alive and was sentenced to death. But Kasab was just a foot soldier. The planners of the attack were safe, to plan and execute another attack. To Vikrant’s horror, even as Kasab in India and David Headley, the Pakistani terrorist caught by the US, had admitted that Pakistan and Lashkar-e-Taiba had carried out these attacks, some politicians from the ruling dispensation were trying to give a new twist wherein they tried to implicate RSS for the attacks. He had no idea why but it was clear to him that the government is unlikely to do anything to bring the real perpetrators to book. He also had no idea why they wanted to exonerate Pakistan. Vikrant had to extract his own revenge, somehow. But it’s not going to be easy. He’s going to need help. Who helps him in this attempt? Will he survive this phase of his life? Will he be able to dodge the police who have come to know of his plans? And what happens to his company which he founded along with Asif? Read the book to find the answers. Author Bio: Retd. Lt. Col. Manish Jaitly retired as a Lieutenant Colonel from the Indian Army after serving for more than 20 years in uniform. Most of his military service was in Jammu & Kashmir. During his service he saw action against Pakistan in Uri, Akhnoor and Gurez sectors, and in Kargil was he was deployed in Baramulla. He retired from the army in Jan 2012. An alumuni of IIM Ahemdabad, he worked in the corporate sector for a few years but then quit his job to pursue his passion for writing. His first book ‘OH MY GODS!’ was based on the famous JNU episode of 2016. An avid reader and a fitness enthusiast, he currently lives in Gurgaon with his wife and two daughters.